Nigeria will experience a partial solar eclipse on Sunday November 3, the Director-General of National Biotechnical Development Agency (NASRDA), Dr Saidu Mohammed, has said. 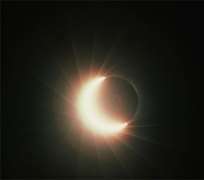 The solar eclipse will come with mild darkness across the 36 states of the federation, the NASRDA boss said. An eclipse is an astronomical event that will have the earth thrown into temporal or partial darkness as the moon blocks the sun's rays from reaching the earth. The Director-General therefore advised Nigerians to remain calm, as the eclipse would not affect satellite communications or air services. Mohammed spoke at a press briefing in Abuja. Mohammed said the eclipse will come in three phases; a partial eclipse at about 1.00 pm when the moon will touch the edge of the sun, the maximum eclipse shortly before 3.00pm when the moon is expected to be closest to the center and shortly after 4.00pm when the moon will leave the sun's edge. He however stated that there is no cause for alarm and Nigerians should not panic. The eclipse, however, will be characterised by a flush of sunlight and mild darkness during its peak. The agency has, therefore, made available at its headquarters, sunglasses, which will serve as filters for the effect of the sun. Dr Mohammed added that: 'It will be like any other day, but its effect will be felt at its peak. It is recommended you wear sunglasses. There is no need to panic,' he concluded. Earlier in his presentation, the Director of Centre for Astronomy, University of Nsukka, Professor Felix Okpara, who outlined the various times of the eclipse across the nation said, in Abuja, the eclipse will begin by 1:03 p.m. It will be at its maximum by 2.40 p.m and it will end by 4.03 p m in the evening. In Lagos, it will begin by 12.50 p.m, its maximum level will take place by 2.40 p.m and end by 4.01p.m. In Ibadan, the eclipse will start by 12.52 p.m, the maximum level will be witnessed by 2.32 p.m and it will end 4.01 p.m. In Port Harcourt, the eclipse will begin by 1.03 p.m, its maximum will be experienced by 2.43 p.m and by 4.09 p.m, it will end. In Uyo, the eclipse will begin by 1.06 p.m, its maximum will be experienced by 2.45 p.m and by 4.10 p.m, it will end. In Enugu, the eclipse will begin by 1.04 p.m, its maximum will be experienced by 2.43 p.m and by 4.07 p.m, it will end and in Kano, the eclipse will begin by 1.07 p.m, its maximum will be experienced by 2.40 p.m and by 4.01 p.m, it will end. An eclipse is an astronomical event that occurs when an astronomical object/objects is temporarily obscured, either by passing into the shadow of another body or by having another body pass between it and the viewer as seen from the earth. Solar eclipse was previously recorded in Nigeria concurrently in 1945, 1959, 2001 and 2006.